It's happening! World of Warcraft is about to turn 10. If you logged in today, you've already seen an achievement pop up. Although the game came out on November 23, 2004 in the US, the in-game celebration begins today. To do our bit, we made a gallery showing how much the game changed in ten years. We've got some images from Blizzard and from a long thread on MMO-Champion mostly from the alpha version of the game—which means these could be much older than ten years—and a few comparisons with their current form. 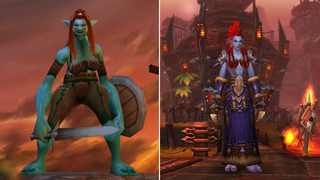 So first let's compare the character models. You've already seen the trolls and their ridiculous alpha model in the top screenshot. But what about the orcs? Or the blood elves? Or the gnomes? No wonder the latter got so much hate during all these years. Here's a very early texture map of the Eastern Kingdoms from an initial alpha build of the game. The southern part looks familiar but things get messy as we go north. No sign of the blood elves, the Hinterlands zone is shown here as "Aerie Peaks" and also what's that "Dragon Isles 65-70+ raid" up there? Whatever that is, it's still not in the game. The early draft of Kalimdor also looked a bit different with Winterspring being in a completely different part of the continent. And Ahn Qiraj as a 65-70+ raid? I'd queue up for that one. And here's how they look now, with almost everything revealed and built, except the closed zone above the Eastern Plaguelands. What could be there? Northeron? Another blood elf zone? Nagas? The mysterious Dragon Isles raid shown in that early map? Here's a really early screenshot of the Arathi Basin battleground. Check the chat log: "Beastmaster and godmode OFF" Wait what? So that's why the Horde always win here. Not much has changed in Arathi and in the other classic battlegrounds over the years. It's still the breeding ground of sneaky subtlety rogues. Gotta love this one too. A somehow level 100 dwarf and a hall without any textures at all. The only thing in this pic that's still in the game in its original form is the initial 16-slot backpack in the bottom right. Molten Core and a 40-man group in it. Just getting there on a PvP server took time because of the world PvP in the surrounding zones. Nowdays you can solo it easily in minutes. This weird unfinished human village was south of Silithus. Its purpose is unknown. It's no longer there, but in the middle of zones full of sand and bugs, this southern spot of the continent still has a mysterious vibe. Here's an early placeholder for Nordrassil, the giant World Tree of the night elves in Mount Hyjal. It just looks sad. Ironforge, the capital of dwarves, with multiple floors. And the current form below. Multiple floors might have been cool, but the city and its layout is confusing enough without them for new players. Dungeon entrances used the Dark Portal model as a placeholder during the alpha. Scholomance for example looked like this. Here's Scholomance today. No Dark Portals, only The Scourge. There was even one of these placeholder Dark Portals underwater near Azshara, which would lead us to assume that there was an instance planned around that zone. Just imagine the nightmare getting there for the first time in vanilla WoW. This is Stratholme and a floating Naxxramas without textures during the alpha. Since then Naxxramas moved to Northrend and the zone became a bit more shiny. And finally an early, robust version of the level 70 raid Karazhan, compared to the current look. Pics via Blizzard and MMO-Champion. To contact the author of this post, write to: gergovas@kotaku.com.